In my years in the title insurance business, when people ask me what I do, it can be difficult to explain. When they ask me where I got my education to be in the title business, I tell them this is a hands-on business. I got my undergraduate degree in Psychology, I learned many things about the human mind and interactions with people. I think that helps me in some way in the title business. I did not go to college to be title examiner or escrow closer, I learned from others in our industry. The Illinois Land Title Association has many options for training and development classes for both title and escrow. Whether you are a seasoned professional in the industry or just started in our industry. With the series of classes that the designation of Illinois Title Professional (ITP) and/or Illinois Escrow Professional (IEP) offers great classes for a new person in the industry or refresher classes for the seasoned professional. Winston Churchill stated “I am always ready to learn although I do not always like being taught”. The next set of ITP and IEP classes are scheduled for November 6-7, 2018 in Lisle, IL; put these dates on your calendar to be a part of the education to start or finish your designation for either the Illinois Title Professional or the Illinois Escrow Professional. There is another option available for your learning experience at the ILTA Annual Convention, July 11-13 at the Marriott Pere Marquette Hotel in Peoria, IL. What is considered “Bad Conduct” in our Industry? We will have a panel discussion about how markets continue to evolve and with that evolution comes more creative ways to keep and grow our title insurance business. However, when does “creativity” cross the line? Come to the convention and be a part of the discussion. 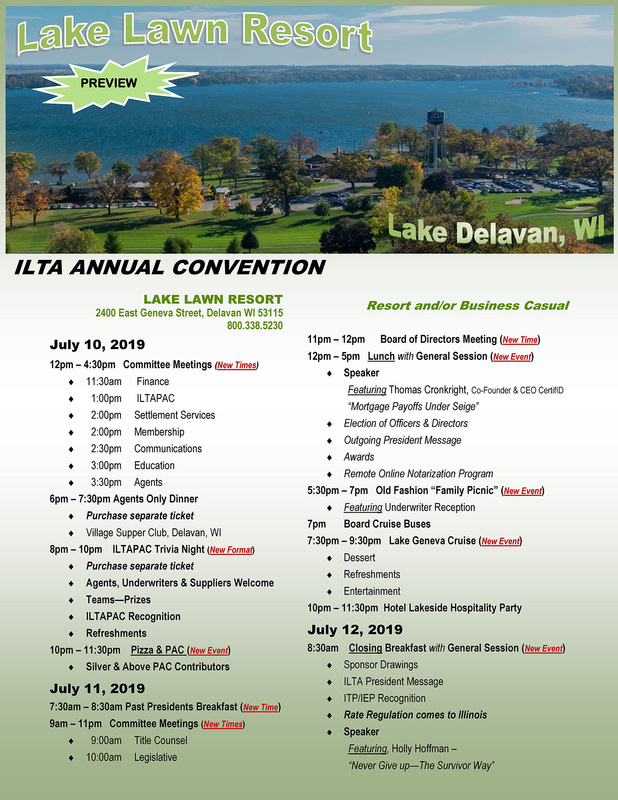 During the convention there is a breakfast for the ILTA Designees and 2017 Leadership Academy Alumni that is scheduled for Friday the 13th of July. If you have your ITP or IEP designation or are an alumni of the ILTA Leadership Academy 2017, please plan to attend the breakfast. If you want to learn from the comfort of your desk at your office, we have FREE Webinars: August 9, Title Traps and Pitfalls and October 18, Closing Traps and Pitfalls. If you think that is all that we have to offer at the ILTA, there is MORE, check out the 15 videos from the ILTA library. Check all of these great education opportunities at the ILTA website: https://www.illinoislandtitle.org/.